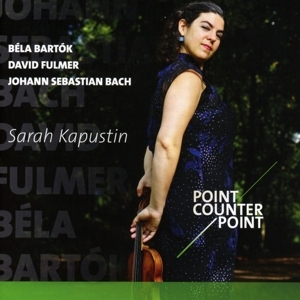 Sarah Kapustin′s musical activities have taken her across North and South America, Europe, Asia and Australia, in performances as both soloist and chamber musician. Born in Milwaukee, WI, she has performed with such orchestras as the Milwaukee Symphony Orchestra, Juilliard Symphony, Pasadena Symphony, Vogtland Philharmonie and the Pro Arte Orchestra of Hong Kong. Ms. Kapustin has received prizes and honors in numerous competitions, including 1st prize of the International Instrumental Competition in Markneukirchen, resulting in solo appearances throughout Germany. She has appeared in such prestigious concert venues as Alice Tully Hall, Carnegie Hall, Cité de la Musique in Paris, the Concertgebouw in Amsterdam, Mexico City’s Sala Nezahualcoyotl, Hong Kong Cultural Centre, and Capella State Hall in St Petersburg. A devoted and passionate chamber musician, Ms. Kapustin has appeared at various international festivals, most notably the Kuhmo Chamber Music Festival (Finland), Musique de Chambre à Giverny (France), Sitka Summer Music Festival (AK), El Paso ProMusica (TX), Peter de Grote Festival (Netherlands) and the Marlboro Music Festival (VT) where she has performed with such distinguished artists as Claude Frank, Joseph Silverstein, David Soyer, and Kim Kashkashian. Ms. Kapustin shows great interest in contemporary music, and has had the honor to work with several composers on their own compositions, including Henri Dutilleux, Kryzstof Penderecki, Jörg Widmann, Ned Rorem and Joey Roukens. For over a decade she has performed duo recitals with pianist Jeannette Koekkoek. In addition to covering a wide range of the violin/piano repertoire, they have performed all ten Beethoven sonatas in Italy and at Indiana University, and their 2010 recording of the complete cycle for the Olive Music label (distributed by Et'cetera/Codaex) received international acclaim. Ms. Kapustin was the 1st violinist of the renowned Rubens Quartet from 2008 until the group's final season in 2016. Ms. Kapustin received a Masters degree in violin performance at The Juilliard School with Robert Mann in 2005. She previously received a Bachelor of Music and an Artist Diploma from Indiana University as a pupil of Mauricio Fuks, and formerly studied with Mimi Zweig and James Przygocki at the String Academy of Wisconsin. She has participated in masterclasses with Joshua Bell, Midori, Leonidas Kavakos, Mihaela Martin and Ruggiero Ricci, among others. After receiving a Fulbright Scholarship, Ms. Kapustin spent 2006 to 2008 in Paris as a student at the Conservatoire National Supérieur de Musique, studying chamber music with Michel Strauss and Vladimir Mendelssohn as member of the Trio Archiduc. She also served as concertmaster of the Orchestre des Lauréats du Conservatoire during the 2007-08 season. Currently Ms. Kapustin resides in The Hague, the Netherlands, where she is active as a chamber musician and soloist, and as concertmaster of Sinfonia Rotterdam. She also performs and tours regularly with the Orpheus Chamber Orchestra and Amsterdam Sinfonietta. Increasingly sought after as a teacher, she has been professor of violin and chamber music at the ArtEZ Conservatorium in Zwolle since 2011, and joined the chamber music faculty at the Prins Claus Conservatorium in 2014. She has given masterclasses in the US, the Netherlands, France, Spain, Brazil, Columbia and Hong Kong. Ms. Kapustin plays on the ”Nico Richter and Hetta Rester” G.B. Rogeri, Brescia, ca. 1690, on loan to her from the Nationaal Muziekinstrumentenfonds in Amsterdam.